Anyone who works regularly in mining or aggregate material production is familiar with crushers. They take the raw material and break them down to a size that is easier to transport or work with for the end consumer. These machines are often used on site, and create a consistent and refined end product. Did you know, however, that there are several different types of crushers? In this first of a two-part series, let’s explore the features of three of the most common types of crushers. Jaw crushers are large compressors which act like a jaw to crush the large materials. One claw of the crusher is fixed while the other claw bends and swings to form a V. As a result of this, the jaws are further away from the top than the bottom. The area between the jaws is normally called the crushing chamber. These are typically made of cast steel and iron, and the jaw liners are made with manganese steel, a very strong metal. 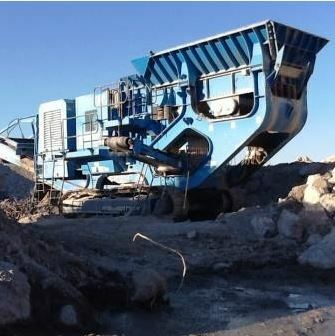 These crushers generally operate only as a primary crusher, reducing materials in a 6:1 ratio, and leaving any additional refinement to secondary crushers. Gyratory crushers are similar to jaw crushers in terms of concept and the metal materials used to construct them, with the jaw liners being made with manganese steel as well. However, with gyratory crushers, material enters the crushing chamber comes where the movable mantle line that is centrally mounted presses along the concave fixed liners, creating a changeable gap internally that crushes material between the two fixtures. As the central spindle turns, it crushes the material along the sides and eventually leads to smaller particles that call through the gap below the crusher. Like the jaw crusher, gyratory devices are commonly used as a primary crushing system, though also can be used for secondary reduction. Cone crushers consist of three primary parts: a crushing chamber, a crushing cone, and an operating mechanism. The cone crusher is similar to the gyratory crusher, but has a less steep crushing chamber. Typically the cone is placed at a central choke point and rotates around, pushing rock against the sides to continually reduce the size further and further. As the materials are diminished in size, they can fall further and further down along the sides of the cone into narrower areas until the material is small enough to fall through the space between the sides and the base of the crushing cone. Check back next week for more information on three more common types of crushers to learn even more about the different available styles. Rackers Equipment in Missouri offers a variety of different new and used crushers for sale in a range of different styles. All crushers are in excellent condition and from leading manufacturers and suppliers like Symons, Stedman and Pegson. Browse our inventory of different primary crushers and secondary crushers online now or call us today at 573-635-8700 to learn more!